Hello Loveys...it's been a while hasn't it. Too long I'd say, but I've been so busy with other stuff there just wasn't enough of me to go around. It's a new year and hopefully a lot more time has opened up to devote to this blog because I do love writing and have missed it and reading your comments on my naughty thoughts. This is probably going to seem an odd place to have this thought (shows you how much I live this) but while at a friend's basketball game the thought of happily ever after popped into my head. Even though that spoiler is always apparent we can't help but take that fanciful journey with the main characters. As I thought about this happily ever after, I wondered; what if the hero and heroine of a romance novel didn't get their happily ever after? Wouldn't that make for an interesting twist? Or have I, after the countless novels I've read, oddly enough, just haven't read that book yet? Have you? But I digress. Unhappily ever after was not the point of this blog piece, perhaps next time. For a long time I've primarily read stand-alone romance novels and every time I do, even knowing the characters are just the imagination of their author; that their story ends with that final word, I can't help but wonder about what happens next. Did it last till death do them part? Were they always happy with each other? Or did that other dreaded "D" --divorce-- win out? I know, I know, they're pointless questions in a fictional world, but I can't help it. After reading The Fault In Our Stars and realizing that even fictional characters have the same questions about their favorite make-believe heroes and heroines, I felt a little less crazy for having mine (or does that make me more crazy? Hmmm). A few years ago I read my first romance series (which also happened to be my first paranormal romance). As I progressed through each book in the series, and the novellas, I caught glimpses of the lives of characters I'd met before. 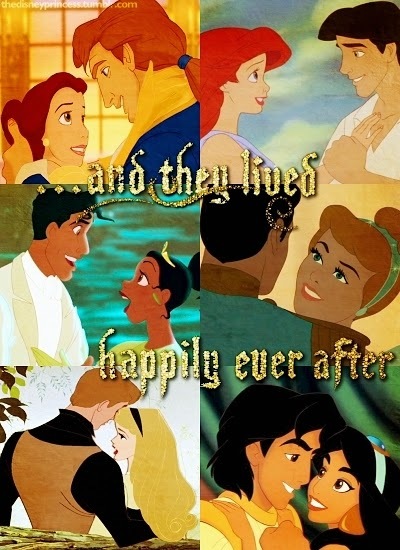 Finally, their lives after the happily ever after. I remember combing through the Black Dagger Brotherhood series wanting desperately to know more about Bella and Zsadist or Qhinn and Blay. I read books in the series that I wasn't very interested in hoping that J. R. Ward would sate my appetite for more about the characters I was really interested in. And at times she did just that. It was interested the learn of Bella and Zsadist's brush with the end of their marriage. I now find myself preferring to read series as oppose to stand alone novels. For me there seem to be a sense of completeness to my reading because of the crossing over of the lives of previous characters into new additions to a series. Maybe that's why I like Disney animated movies so much, there's always a part 2. And that's my naughty thoughts on happily ever after.